I know lots of you kitties and your humans are big Etsy fans — and I know lots of you kitties are a little jaded about cat beds, cat toys and such. (I know I am!) So I decided to put together the ultimate Etsy gift guide for you kitties who have everything! I looked for the most unique cat gifts, and luckily for your human’s pocketbook, not all of them are hugely expensive. Only some of them. I bet there’s something for every human’s price range. Let’s get started. Haven’t you always dreamed of having your very own ice cream truck? And with no boring flavors like vanilla or chocolate either! We kitties would much prefer mackerel and swordfish. Well, here it is, right out of your dreams, courtesy of Etsy seller Famous OTO! 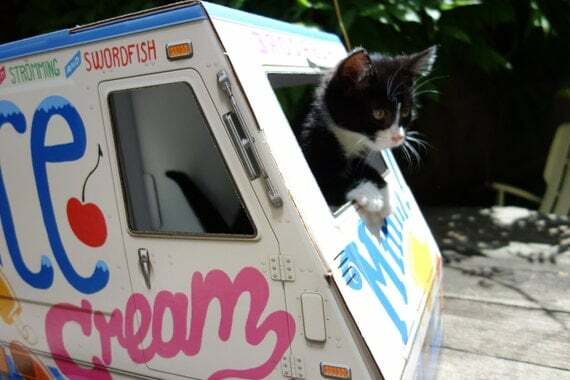 Okay, so it is just a cardboard playhouse and doesn’t actually drive down the street, but I bet you can get your human to make some albacore ice cream to enjoy with it. What a cute cat bed! It’s made with painted wood and 100% cotton duck fabric. The black frame and hot pink Hootie Hoot bedding caught my eye — but if you’d prefer the frame to be white or a different fabric selection, go for it! The human at Simply Jeanna will be more than happy to whip up something custom for you. This bed is sturdy (for pets up to 15 lbs.) and easy to care for — and while it’s not cheap, it’s a good price for a nice piece of cat furniture. Many years ago, my human found a prefab version of what you see above at some pet store, and for a couple of years, it was one of Binga’s very favorite toys. You would have thought she sprouted wings the way she flew after it (she was also just a kitten so she was extra crazy). This fishing pole cat toy is like that one, only better made. 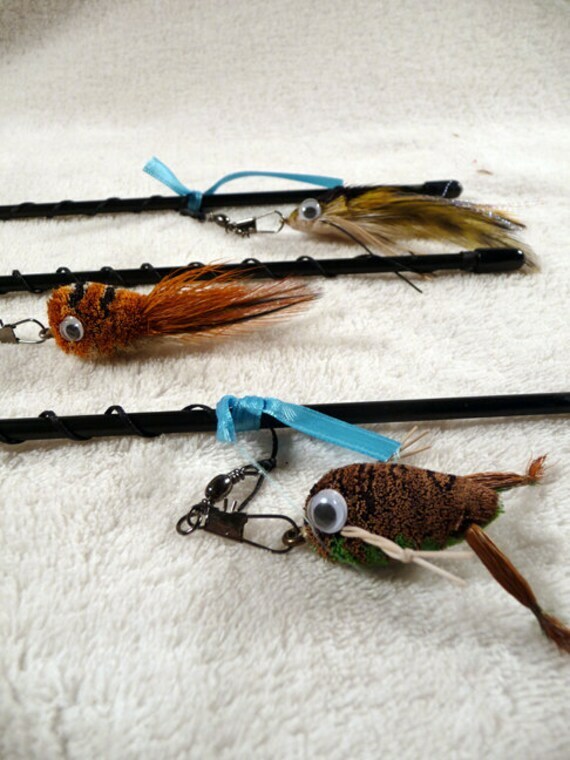 It has a strong, braided line for durability and it’s long enough to cast the toy across a 30 foot room! The handle on the reel can be switched for either right or left handed humans, and there are two extra toy mice included for variety. The Catcha Cat Fishin Poles seller originally made this for his overweight, diabetic cat, and all that exercise helped the big guy drop 5 lbs. In fact, it was the only thing he’d play with. 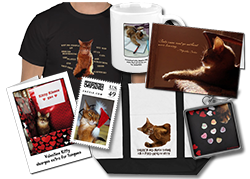 I bet you kitties would love to see this as a holiday gift! 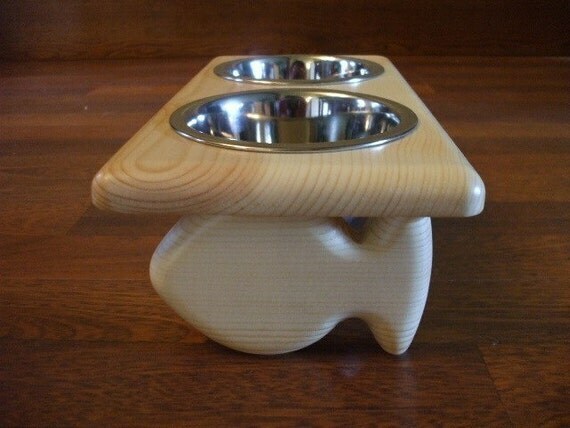 I love the clean lines and simple beauty of this feeding station for cats. The bowls are one pint stainless steel, and you have a choice of finishes for the wood so your humans can match the decor… or your fur. Woodin’ You has a variety of other styles of kitty feeders too — they’ve been making them since 2004! This would make a much-appreciated gift for a senior cat, or any other cat who prefers their food a bit elevated. The graceful curves of this wall-mounted shelving are made specifically with cats in mind! They are not book and knickknack shelves masquerading as cat perches. These come with built in mounting brackets and can support multiple cats. 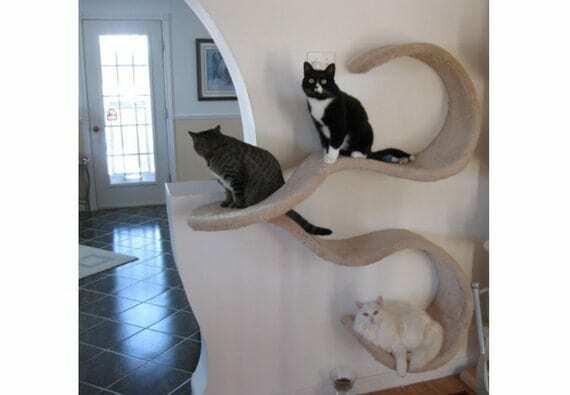 Made of the finest materials by Cloud Nine Cat Trees, the standard covering is beige carpet — but you can contact the seller for custom options. These catnip mice, made of yarn and stuffed with pellet catnip and a bit of polyfill, are awesome stocking stuffers! They’re a little more special than the usual mice toys because of the cute (and bitable) ears. 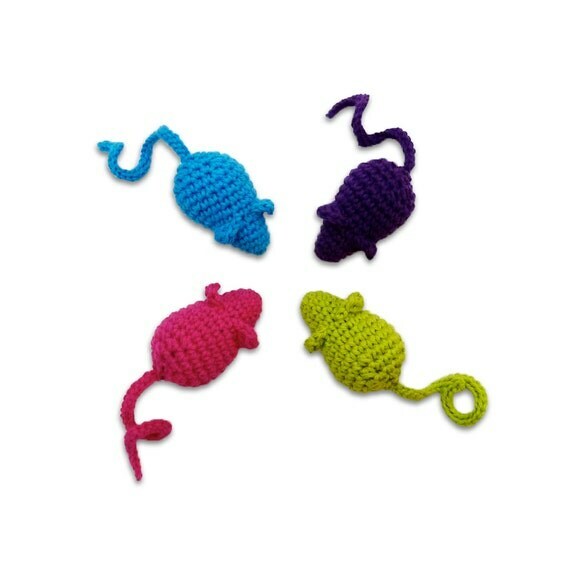 These cat toys by Cherry Willow are 3-1/2″ x 4″ with a 5-1/2″ long tail, so they are young rat-sized! (I know this because of the rat I caught!) Cherry Willow has some other fun catnip toys too, and I suggest you check them out. Are you cardboard scratcher lovers like us kitties here? Then you’ll really enjoy the Original Catpod! 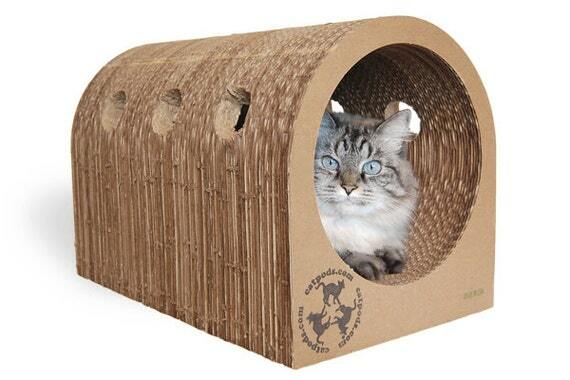 Made of eco-friendly, industrial strength cardboard, this is more than a mere scratching environment! It’s a napping spot, a tunnel to zoom through, and with the peepholes, it has endless possibilities for fun kitty games! The Original Catpods human makes some other cardboard scratcher accessories too. If you already know about this Yoga Cat Mat, you’ll also know I’m one of their spokeskitties. We have a green mat and one of us can frequently be found hanging out on it. It’s a cool lounging surface and, of course, a good place to practice your Downward Facing Cat pose (or better yet, Shavasana). I recommend the gift set, which includes two toys and a muslin bag of catnip! 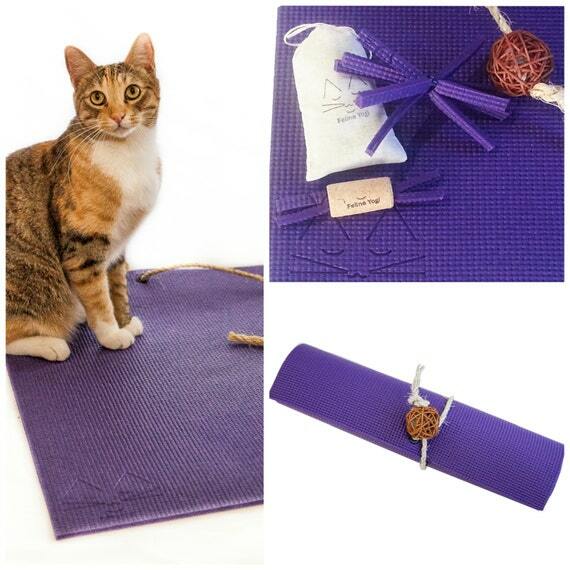 If purple isn’t your thing, the Feline Yogi human has a variety of colors, and you are bound to find one you love. At cat shows, you can find vendors selling all sorts of unusual cat toys that people buy to keep up their cats’ energy when they are going into judging rings. One of the very favorite types of toys are those that look like what you see above! These toys really do move and wiggle like living critters, and they are lots of fun! These wand teasers come in home-sized lengths, either a 12″ or a 24″ wand. The toys are interchangeable, so you can always browse through The Meow Match Shop and buy several toys for one wand. Talk about elegance and style! This elevated cat bed is a high quality, sophisticated piece of feline furniture that blends right in with today’s modern decor. 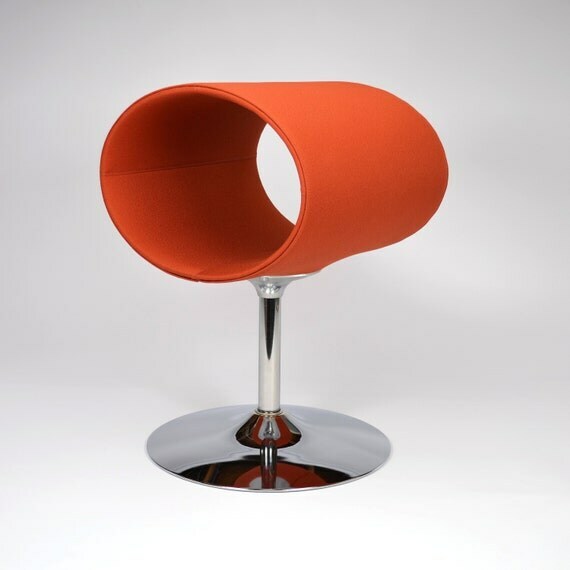 The tube is made of tough materal, and you have a choice of 31 colors of fabric and 21 colors of recycled leather. Made by Faust Brothers, these beds are built to last and look good for years to come. Now, this is really for the cat who has everything! 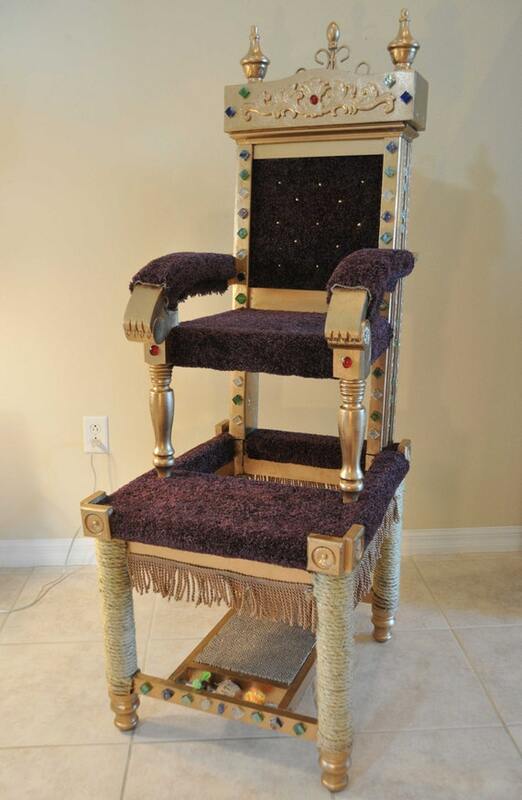 Show who is in charge at your house with this amazing throne, lovingly hand crafted by the Square Paws human with stunning details fit for a kitty king or Queen! This is an amazing lounger that all the cats on social media will be talking about. 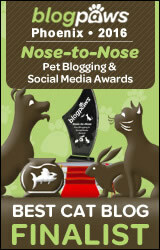 Be the envy of your feline Facebook friends and Twitter kitties! Pose on it and show off on Instagram and Pinterest! Just remember to be a little bit humble — otherwise your subjects may rebel. Oh, and I even found something for those kitties who wound up on the Naughty List! 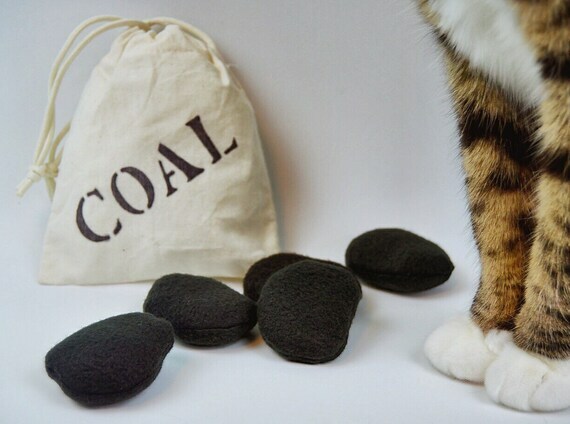 Yes, you get lumps of coal… but they are stuffed with catnip, so it’s not all bad! From Housecat Club, which has lots of very fun catnip toys for good and bad kitties. Want to do more gift shopping at Etsy? Check out their Holiday Gift Guide! Disclosure: I am an Etsy affiliate so if you follow any of the above links and buy something, I will get a small commission… a not-quite-as-small commission if you buy one of the pricier items! But I only share things I think my readers would really enjoy! What original toys and furniture, etc! We love how that one kitty on the kitty shelves is looking to see who might have rung the doorbell, MOL! Well that sure makes fer OUR Chrissymouse List!!! That is a great round up of gifts. I really like the wall shelves. I had stopped reading at the bed cos when I went to the site, I wanted the canopy bed so badly everything else paled until I came upon the throne. Queen Keisha needs this. Well, of course we want the cat shelf. Or maybe two. Ooh! I so want those cat shelves! Great list, Summer. Oh my Cod! Those are fabulous! We’ll have to check them out! Fantastic finds! We especially like the ice cream truck. There are some great ideas for gifts there! Ok, I need to get my momma to Christmas shoppin now! 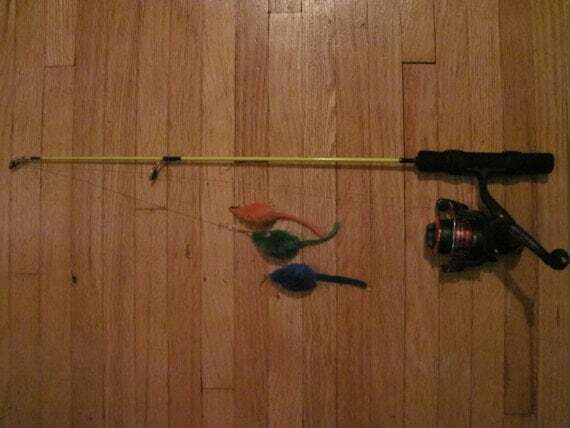 I have the fishing pole and love it! Have had it for quite some time. I would love the ice cream truck and that is pretty much about it! Oh, maybe the mice! Oh the bed, the bed and the mounted cat shelf! These are pawsome! Our Mommy will definitely be checking some of these out. She just ordered us a wall mounted food/water dish from etsy. She loves that website! Thanks, Summer. I think the lady is going to get us the Meow Match wand toy for Christmas. Thank you! We’re setting our mom right this minute to check out those catpod scratchers, the royal throne (because why not?? ), and the bag o’lumps of coal. We just happen to know someone who deserves those. That is a bunch of great items. We will take one of each. They do look like great presents. Good looking items. Those are some awesome gift ideas, Summer! I LOVE the owl bed, but it is way out of my price range, MOL. I’ve been wanting to get Carmine a second raised food dish (for his arthritis, he seems more comfortable eating and drinking from raised dishes), so maybe I will get him this one. I love the fish on the side – very stylish! I love these gifts. I should get the lump of coal for my Ginger LOL. My word ! that’s a lot of very sophisticated stuff ! My cats are snobs, they prefer a simple carton box, real mice, aluminium balls and our armchair to do their pedicure ! Yes. You are right. My cats would rather hide in a paper bag to attack distracted humans, sit in our computers and couches in the sun and fight dangling strings. They would all turn their noses up all this expensive stuff. Oh my goodness,there are so many things I want pretty Summer! I have added the fun kitty perch to my list and the throne!! OMC that throne is soooo purrfect!!! Thanks for sharing these. 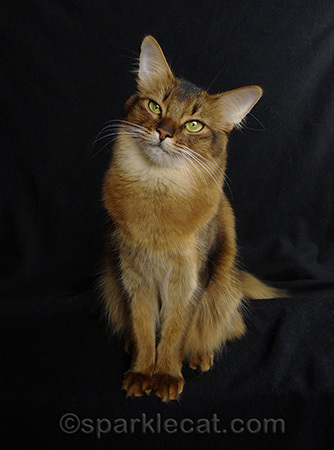 wow – there is some amazing things being made out there for cats…..
lots of good ideas and stuff. as a bonus I’m sure the boyz would love any of the boxes the stuff arrives in. Wow, lots of awesome stuff! What kitty wouldn’t want most or all of that! What cool stuff, Summer! We definitely deserve the throne….though the mom says it won’t go with the decor. Phooey! Mom!!! I totally deserve that Cat Throne! I command you to get it for us – Toby. There are so many things to choose from we wouldn’t know where to start. That’s really some cool stuff. All kitties need a thrown like that! Those cat shelves are too cool!